It's disheartening to be bombarded by election political talk that abstains from raising issues of life and death affecting America and the world. In this "Truthout" article of 29 September 2016, I focus on the failures of the US Environmental Protection Agency that mirror broader political and social forces at work. 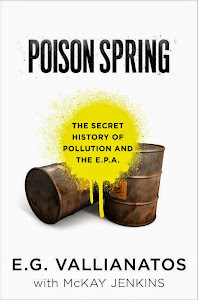 My hope is that all thinking Americans, and especially those considering themselves as environmentalists, would read "Poison Spring" and then ACT to bring to an end the misuse of science and the corruption of public institutions like the EPA. But, above all, Americans must rethink all that goes under business as usual. We need to rebuild this country to reflect our knowledge of the natural world and public health.